Complete the Graduate Recognition Form by April 21st (to be guaranteed a gift May 19th). Send the photos (jpeg format) to joyce@gravelhillumc.org by May 15th. We would love to have you share 2-3 photos of yourself. These will run during the recognition part of each service on Sunday, May 19th. Join us on Sunday, May 19th for our Graduate Recognition. Please complete the information regarding your graduation so we may recognize you on Graduate Recognition Sunday. Please select the service you will attend. Please list the full name from where you are graduating (High School, College, Trade School, etc.). Please list where you plan to further your education. Please list the major you are choosing. 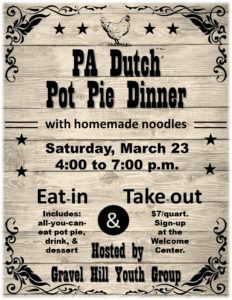 Saturday, March 23rd is also the date for the 8th annual Pot Pie Dinner! Eat in (4 PM – 7 PM in Fellowship Hall) or take out. 6-6:30 PM Kidz Choir: *Drop Off Tonight: Sanctuary. Tonight’s Focus: our song for Sunday, My Lighthouse. (Sanctuary) Please see the special note from Miss Joyce at the end of this post. 6:45 PM Son Seeker’s Ladies Bible Study (Room 305) *Please note: No meeting on 10/31. 10.18.18 6 PM: For those with tickets, Annual PACC meeting @ the multipurpose room of Palm Lutheran Church, 11 W. Cherry St. Palmyra. 10.20.18 7:30 AM: Check In for the Fall Feeding Frenzy 5K at the Londonderry Village Pavilion, 1200 Grubb Rd. Palmyra, PA 17078. Race begins at 9 AM. Kid’s Fun Run occurs at completions of 5K run/walk. 11.2.18 9 PM – 11.3.18 7 AM: Youth All Nighter: GRAVITY @ Flightpath Sports Park. $20 for the whole night of activities! To register, click here. Thankful Thursday comes from our Pioneer Clubs! We had a great time at Pioneer Club last night. We are so happy to have some old friends join us again. Thanks for helping Miss Megan. 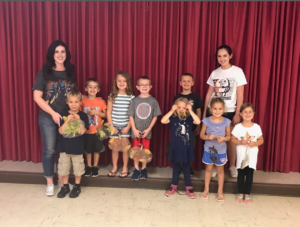 Pee Wees show off their fall craft. Enjoy these photos bringing some rays of sunshine and gratitude to your day! All Saints Sunday Preparation: If you have a loved one who has passed this year and would like their photo as part of our All Saints Sunday Worship prior to November 4, 2018, please bring their photo to the church office by Monday, October 15. We will scan in and give it back to you. One week left to sign up online for the Fall Feeding Frenzy 5K! Weekly Wink Update: Tonight only: Revelation Bible Study is cancelled. It will resume next week. Saturday (10/6): ChiliFest from 11 AM – 2 PM at 520 Birch Street, Palmyra 17078. Still thinking about being a part of the Fall Feeding Frenzy 5K on October 20th? Get signed up by clicking here! Tonight (Wednesday) is the start of Kidz Choir. It is from 6:00 – 6:30 PM. Annual Charity Motorcycle Ride is on Saturday, 9.22.18. Registration: 9 – 10:45. Ride: 11 – 2 PM. Ride giveaways, pig roast, and more to follow the ride at Gravel Hill. To find out more, click here. Be In The Light Meal (BITL), Fellowship Hall, 5:30 – 6:30 PM. RSVP is requested. To find out more, click here. 33 Series: Authentic Manhood, balcony, 6:30 PM. Youth Group, 6th – 12th graders, library (Heritage Room), 6:30 – 8 PM. Pioneer Club, children ages 3 (must be potty trained) through 5th grade, Fellowship Hall, 6:30 – 8 PM. Tonight (Wednesday) is the start of Pioneer Club 2018-2019. It is from 6:30 – 8 PM for children ages 3 (must be potty trained) to 5th grade in Fellowship Hall. Learn more on our web page by clicking here. *Please note: Children’s Choir practice begins next Wednesday. 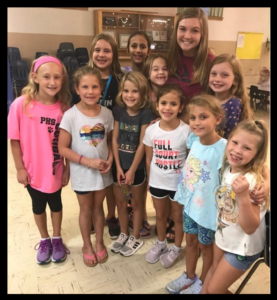 Children’s Choir Practice begins on Wednesday, 9.19.18, from 6 – 6:30 PM. Annual Charity Motorcycle Ride is on Saturday, 9.22.18. Registration: 9 – 10:45. Ride: 11 – 2 PM. Ride giveaways, pig roast, and more to follow the ride at Gravel Hill. The youth and family cook-out/bonfire has been canceled for this evening, August 3rd, due to the weather forecast. Enjoy your evening! Vacation Bible School (VBS) has arrived! The fun begins today! Check in opens at 5:45 PM and activities begin at 6 PM. You can download and complete your registration now (by clicking here) or register on site. Want to see what fun is in store is week? 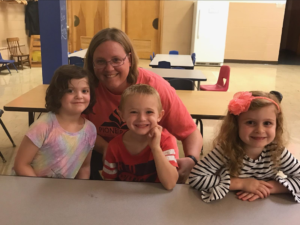 Check out our VBS page here.